This interesting surname is of English locational origin from either of two places thus called in Leicestershire and Nottinghamshire. The placenames are recorded respectively in the Domesday Book of 1086 as Herdebi and Herdrebi and the first element either derives from the old Scandinavian "hiorth" meaning herd, flock or the old Norse personal name "Herrothr", old Danish personal name "Heroth". The second element is the old Scandinavian "by" meaning a village or homestead. The surname is first recorded in the latter half of the 16th Century (see below). On June 18th 1570, Thomazin, daughter of Thomas Harby, was christened in St. Dunstans, Stepney, the marriage of Elizabeth Harby to William Avery, took place on December 13th 1573, at St. Michael's, Cornhill, and John Harby married Ann Saltonstall, on February 28th 1575 at St. Dunstan in the East, London. 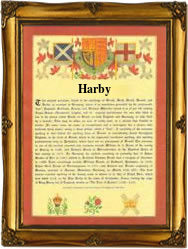 A coat of arms granted to the Harby family depicts a red shield with an ermine jaggged fess and ten silver billets, four in chief and six in base. On the crest there is the top half of a black eagle with expanded wings. The first recorded spelling of the family name is shown to be that of John Harbye, (marriage to Ann Morden), which was dated April 20th 1564, St. Michael's, Cornhill, London, during the reign of Queen Elizabeth 1, "Good Queen Bess", 1558 - 1603. Surnames became necessary when governments introduced personal taxation. In England this was known as Poll Tax. Throughout the centuries, surnames in every country have continued to "develop" often leading to astonishing variants of the original spelling.